The weather held long enough for the Phase 1 clearance of the pond to be completed. The water is flowing in gently but there is much mud and silt covering the gravel bed. This is very deep in places. The willows in the second half will be removed next year and order restored. 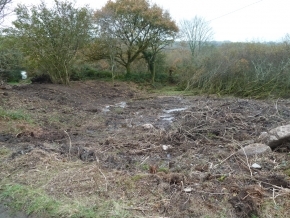 The Himalayan Balsam was successfully pulled to prevent further seeding over a large area and the bracken spraying carried out by the Caradon Hill Project will enable us to continue this into areas which were impenetrable this year. We really do need more volunteers to ensure we get every plant. We have pinpointed the well site and uncovered one corner of the well chamber. Further work here will need to be carried out very carefully to ensure that the silt filling the chamber does not wash down into the culverts which drain it. We are very pleased with a successful first year and look forward to spring when we can continue the work so well begun.